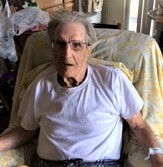 Walter Griffith, age 94 passed away at his home in Kodak, TN, Thursday, July 12, 2018. He was a Coal Miner and he loved the outdoors and enjoyed hunting and fishing. He is preceded in death by his father, mother and sister. He is survived by one son, Walter Griffith, daughters, Helen Richardson, Edith Richards and Evelyn Richardson, children, Becky and Kenny May and ex-wife, Janice Griffith, along with a host of grandchildren, great grandchildren and special friends. The family will have a graveside service Saturday, July 14, 2018 at 12:00 noon in the May Family Cemetery, Stephens Community.